Sustainability is becoming more important than ever, and sustainable eating is a great way to do your bit. A vegetable garden is an easy and fun way to eat fresher, healthier and tastier food and reduce your environmental footprint. Most of our grandparents had veggie patches and there was nothing like the taste of those fresh, home-grown tomatoes, rhubarb or strawberries. Vegetable gardens are becoming more popular than ever and people are finding ways to squeeze them in anyway they can. With over 20-years experience in landscaping, we know how to work with your space and give you a fertile and stylish little patch of ground for you start growing your breakfast, lunch and dinner on. Veggie gardens are very fashionable and you can add real value to your home by having one installed. 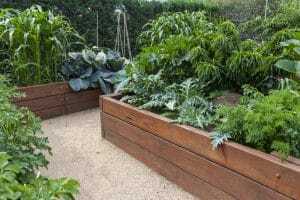 A veggie patch doesn’t have to be that pile of dirt with chicken wire around it that you saw at Nan’s house, it could be an attractive element in your backyard. Vegetable gardens are a real money saver. Once established, your patch your food costs will drop dramatically. The industrialisation of farming means that our fruit and vegetables aren’t what they used to be. All sort of nasty hormones and pesticides are used to get those pumpkins and peas on your plate. When you grow your own you are in control and you can enjoy your fruit and veggies the natural way. A veggie patch is a lot of fun. You’ll love getting your hands dirty and watching the seeds you plant turn into delicious food. It will get you outside more and put you back in touch with nature and in this busy, concrete world that really is something precious. We have the experience you can count on to make that barren corner a fertile paradise. 20 years of experience in landscaping has given us unparalleled knowledge of how to work with the environment. We know how to use soil, light and water in your favour so you can see a quick return on your investment. Veggie patches are a great way to look after the environment and going with Everlast Services is great way to look after the economy. We are 100% Australian owned and operated and try to use Aussie products wherever possible. We can take care of the entire process for you. We can dig up the dirt, fill in the soil, build the fence and even add all the decorations. Our team is experienced in all aspects of landscaping meaning all you have to do is pick up the phone and let us take care of the rest.